TCD, Trinity College Dublin, is a brand. Its one that has stood the test of time for literal centuries. It is, along with a very few others, one of the few global brands we have for Ireland. We are told that we have to change the name to Trinity College, The University of Dublin, as people in Chindia get confused. Hmmm. Do they get confused as to what MIT is ? Or Caltech? I doubt it. They may be momentarily confused as to whether it is an independent university or not but is that reason enough to meddle with something that is time proven? I have not seen any evidence adduced, mere assertion, that this is a problem in recruiting Chindian students. Call me old fashioned but I would like evidence. Its worse. Leavign rankings aside its useful for people who wish to find research to know where you are working. Bibliographic databases, such as Web of Science and Scopus and so on work on institutional affiliations. Now about 75% of all TCD work is labelled Trinity College Dublin. So that will remain as it is for all outward facing activity. But out in Chindia we will be Trinity College the University of Dublin. Presumably the confusion as to what exactly TCD is and was will now be replaced by confusion as to why nobody from TCDTUD is publishing (but gosh them lads in TCD seem very active). This is the present shield…. doesn’t it just scream CHEAP !! CHEAP!!!! So easily confused with Maxol…. (yes, that was also an argument). There is a good argument to look again at brands. And theres a good argument that we should have one consistent logotype (we have at present dozens, and thats confusing). 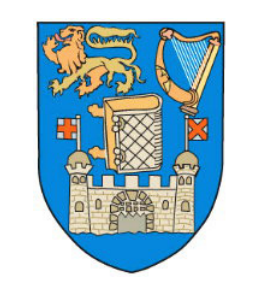 What’s concerning to me is that we seem in this exercise to have taken absolutely no cognizance of the heraldic elements – TCD is an essentially medieval conception, and thats part of its strength. We can for instance recognize the essential religious nature of the original foundation with a bible without having to accept the literal truth therein or to say that TCD is now a religious institution. We have spend the equivalent of 20 PhD fees or the cost of two postdocs on a casual rebranding. The evidence from internal surveys is that the academic staff (those much vaunted frontline workers) were in the majority (50-80% depending on the question) happy with the visual identity of the college. One wonders why that was ignored? One also wonders when we have marketing and design professors why they were not consulted. College is broke. We have spend c 100k on this so far. We will spend how much more on this? . Frankly, a cent would be too much. This does nothing to advance the core mission of the college. 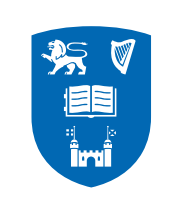 This entry was posted in Blogpost and tagged crests, higher education, irish universities, rebranding, TCD, Trinity College Dublin on March 30, 2014 by brianmlucey. This is a version of my column published in the Irish Examiner 29 March 2014. One thing we know from even a cursory study of economics and finance is that there are cycles. This time is rarely different. Sometimes the cycles are short, sometimes longer. But they are there. Regulators and officials contracted to mitigate the effects of cycles need to first be aware of them and then to understand them in a holistic fashion. Understanding them requires more than just advanced quantitative techniques. Consider for example the data from the Operational Riskdata eXchange Association , a non profit body which looks at financial services risk and losses. Losses are very skewed – the vast majority of losses rise from a small number of issues. These issues tend to be concentrated in areas where the ultimate control is a person. The greatest part of these losses are not down to fraud; they are down to issues such as poor business practices and poor execution of these practices. A particular challenge for finance is that many of the problems that it faces are systemic. While in a healthcare or automotive context individuals can and do take responsibility for ameliorating risk (not leaving surgical tools in body cavities, not forgetting to reconnect brake cables) this is not the case in finance. There we find a significant disconnect. Take LIBOR – if an individual were to have not cooperated in the rigging scandal they would in all probability been sanctioned, and the system would have continued. Rogue traders are almost never driven by personal greed and a fraudulent aim. Therefore exemplary punishment and condign treatment of one will have no great effect on others – they fall prey to and then become trapped in system failure, and it is at the level of systems that regulation needs to work as well. A key weakness of the modern financial regulatory system architecture is that it is not systemic. Nobody is looking at large parts (FX in particular) of the system; other regulators are nationally, industry or product bounded. As a consequence, the coupling of parts of the system to other parts can become looser or tighter without anyone being able to intervene or even perhaps notice. A further key weakness is that it is focused on quantitative approaches. Quantification of risk is funny thing. It relies on failure – to know how often we will have a large market drawdown or a rogue trader or a systemic crisis we require a baseline of a number of these events. In the Irish context we have financial regulator and central bank that has been very strongly hiring quantitatively skilled persons. These are ideal at looking at the probability of a mortgage default given lender demographics, or at the role of SME finance etc However, they are limited to the data which they have. This data is typically partial- nobody is looking at the system as a whole, domestically or internationally. What is more, an over reliance on quantitative techniques alone misses the crucial human element. Systems fail either because they are poorly designed or because people find a way around them. The best designed system will not survive contact with someone inept or determined enough to circumvent it. Chernobyl comes to mind… This raises the question – where are the holistic risk managers? The vast majority of risk management approaches in finance, as seen in the professional risk manager programs and certification, are rigorously quantitative. But they are almost bereft of even behavioural economics or finance. They contain little if any around economic or financial history. They are not people cantered. This is a major weakness. Our regulatory bodies need to take on board a much more holistic approach . On one level this means that we need to see a push for greater scope of regulation on areas such as the Repo or FX or commodity markets where existing regulations are weaker. At another more fundamental level it requires hiring psychologists, behavioural finance and economic specialists, anthropologists, sociologists and historians. Cross disciplinary teams need to be more than accountants and economists. For so long as we do not regulate finance in a human cantered systemic manner we give an implicit nod that these issues are not important. They are and we should begin to signal that clearly and unambiguously. We need more regulation and better (more holistic) regulation. We need finance to learn from other areas such as surgery or engineering, where safety and risk mitigation are inherent. We need to change culture – this can happen as we have seen in airlines- where individuals are not only empowered but required to halt the system when it is in their opinion going awry. 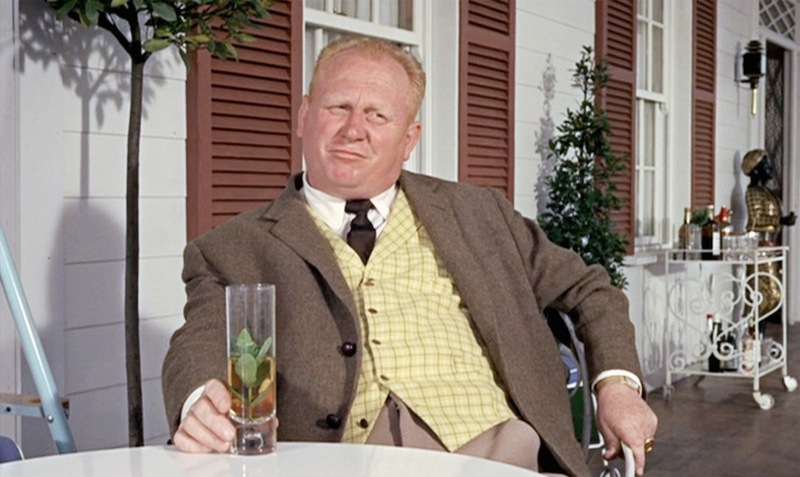 And we need to recenter and deglamorize finance – it needs to be seen as a boring utility. This entry was posted in Blogpost, Journalism and tagged economics and finance, finance, regulation, regulatory capture, risk, risk management on March 29, 2014 by brianmlucey. This is a version of my Irish Examiner Column of 8 March 2014 . Spring is in the air and the economic sap is rising. Or is it that economic saps are rising? Anyhow, the other thing that spring brings is growth and it does look as though finally those long hearalded green shoots are showing in the Irish economy. Green shoots are tender however and a blast of frost can seriously damage them. The world is unpredictable – who last month would have foreseen the invasion by Russia of another country and the lurching back to the cold war rhetoric that we have seen. Geopolitical scares aside, the notion that we are out of the woods is scarcely believable when one looks at the hard data in toto. The labour market looks good – more on this anon. But we are celebrating the recovery of the two pillar banks in a week when they announced that between them they had lost an aggregate €2.2b in 2013. Even the minister for finance, while lauding the return to normal banking (huh?) did opine that perhaps we needed a third banking force in the state. Normal banking is not one in which an effective duopoly, two main competitors, exist for all bar the largest companies, where these two are lumbered with losses and unable to fully engage in credit creation and where shadow banking entities take their place. That’s wholly abnormal. But at least unemployment is falling. Much was made of the fact that the headline figures for unemployment fell below 12% and 400,000 persons, important psychological barriers. Indeed, much was made that we are now below Euro area averages for unemployment. But 12% overall masks the reality – we have seen the renewal of mass emigration and we have 85,000 people on jobbridge and related schemes. We have in other words again and again failed to provide meaningful employment opportunities for our citizens. The hope of the government is, seemingly, pinned on high-tech , start-ups and construction. Lets think this through. While in the last while there has been a boom in entrepreneurship, the reality is that this is not going to solve the problem. The bulk of job creation comes not from startups but from small companies becoming medium sized. We need to switch our focus from the S to the M in SME. We need to create an Irish middlestadt sector. In Germany these companies are the backbone of the economy and of the export engine. We need to determine what it is that we are good at doing and focus on growing indigenous companies to go from 5-10 jobs to 50-100. In terms of construction we need to be careful for what we wish. All the straws in the wind point to a deep seated desire on the part of the powers that be to reignite a property led growth strategy. This is folly of the rankest kind. And then there’s the high-tech sector. Looking at the most recent data, Q4 2013, we get a pretty good picture of how the Irish employment situation has changed over the last decade. The EU have a classification of employment in to high tech etc. It makes for sobering analysis. In 2004 employment in what the EU classify as High-tech manufacturing accounted for 3.4% of the labour force or 71,000 persons. By end 2013 this had fallen both as a proportion, to 3% and in absolute terms to 57,000 persons. High-tech manufacturing is he pharm, chemical and computer industry areas that are neither job nor tax creators for Ireland. The high-tech financial services industry has while shedding 5000 posts since 2004 from 93000 to 88000 persons increased its share of the employment cake from 4.4% to 4.6%. The largest rise in any hi-tech area comes in what is classified as Knowledge Intensive Other services, rising from 481,000 persons to 541,000, from 22.9% to 28.4% of the labour force. This is dominated by the health, education and arts/culture sector. Then as now the bulk of those employed are in the “other” sector, other by reference to knowledge intensity/high tech. The others are dominated by the retail, construction and distribution/logistics sector. Of these only one seems to be in the forefront of the governments mind. Retail employs just under 10% of the workforce. It is in fact the largest employer percentage wise. Combined with the hotel and catering industry this accounts for 15% of employment. That is where we can create large numbers of posts. Despite the noise, retail sales are still very impaired. recent upticks in retail sales are driven mainly by the motor trade (which accounts for less than 2% employment). Excluding this we see a <3% rise in volume of sales and less than a 1% rise in value on a year on year basis. Until aggregate demand increases we will not see a recovery here. Focusing on construction may be understandable. Looking at the live register 83000 craft and related and 65000 plant and machinery workers constitute the bulk of the register. Most of these are over 25, and the reality is that in the vast majority of cases do not possess the skillsets to thrive in the modern economy. This does not mean that we abandon them but it does mean that continued long-term unemployment is a real likelihood. That is not an excuse however for a focus on construction. We do not need to see a situation such that we have persons drawn from school or training at an early stage into a cyclical sector. But that is what we run a danger of doing with this focus. This entry was posted in Blogpost, Journalism and tagged employment, labour force, Unemployment on March 27, 2014 by brianmlucey. The people risk symposium held yesterday was well attended, with about 75 delegates from a variety of financial and regulatory bodies. A general consensus was evident that financial services needs to be much more concerned about systems and their interlinkages, and to take on board more insights from anthropology, sociology, psychology etc. The proceedings were recorded and will be made available later. Meanwhile below see slides where available. This entry was posted in Blogpost and tagged financial services, people risk, regulation, risk on March 27, 2014 by brianmlucey. The ESRC seminar series on people risk (being organized by this motley crew) rolls into Dublin next Wednesday. The final running order is as below. The seminar is free, and coffee/tea and a light lunch will be provided. Venue is Institute of Bankers, IFSC. This entry was posted in Blogpost and tagged behavioral finance, finance, financial services, policymaking, risk on March 21, 2014 by brianmlucey.